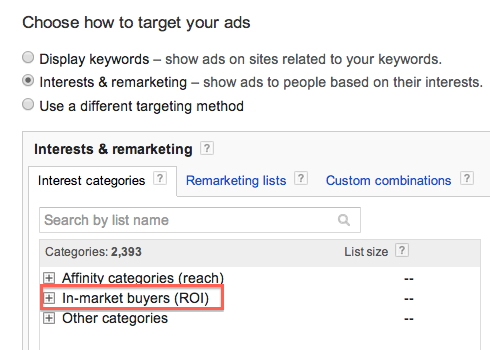 If you’re running display campaigns through your Google AdWords account, you may have noticed a new targeting option called Display- In-market Buyers (ROI) in your interest categories section. In-market segmentation is a new audience targeting method that allows advertisers to target users who are actively looking to buy certain products or services in the near future or have high propensity to buy if they find the right product or offer. – Identifying content that indicates user-intent to purchase an item. For example, someone browsing consumer reviews and price comparison sites. – Considering how often and how recently a user visited these pages. – Identifying contexts where users have previously clicked on ads related to the product or service of interest and have converted. – Considering common search keywords that led users to the page. – Looking at display impression data or 3rd party data or both. The set it up, I recommend creating a separate display only campaign dedicated to this targeting method, so you can use a different budget for this test. You’ll find Display In-Market Buyers in your Interests & remarketing section as you create an ad group and choose how to target ads. 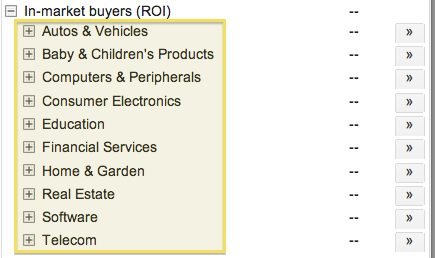 The current available targets include categories such as “Autos & Vehicles” and “Education” and many others, as well as sub-categories if you’d like to make your audience more specific. If you do not see a category that’s relevant to you, make sure to check back as Google has been adding new categories since the launch of this feature. I suggest keeping the bids more conservative than search, since you’ll be reaching a much more wide pool of users. Make sure that you add image ads, and if you’re planning on using text ads, create separate ad groups for the text and banners, so you can use different bids. As with any campaigns, check in on this campaign to make sure it’s bringing you the right types of visitors, and optimize by adjusting bids, excluding placements, and trying different ads. So far, I am seeing a large amount of traffic from this strategy, but conversions have not been even close to search. It will likely convert worse than your remarketing campaigns, but could be a nice source of additional traffic for those who are looking to brand or reach new pools of users. This entry was posted in Display, Google AdWords, PPC and tagged Display In-Market Buyers on March 21, 2014 by kristina.